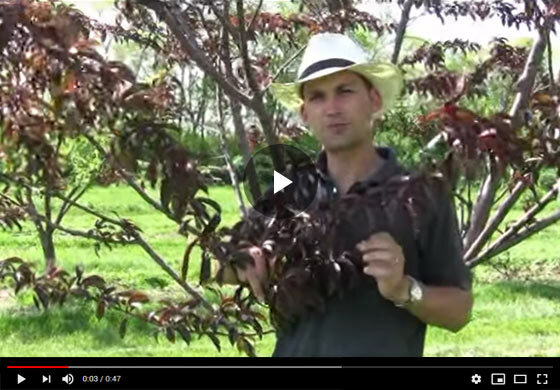 Felix from Gurney's shows off a Flat Wonderful Peach tree and demonstrates how to thin the fruit. Witness the pretty, wonderful red foliage and learn how to pick off the fruits so as to create the perfect balance within the branches and grow the biggest, juiciest peaches ever! Hi everyone, Felix here with Gurney's. I'm with one of our Flat Wonderful trees here, it's just after flowering is finished and the fruit is just beginning to set. And I wanted to point out one of the wonderful things about this peach tree, is that with the red foliage, it's really easy to spot your young fruit. As you can see down here, we have here the fruit set, and you can see these nice little fuzzy babies here that are just growing for us and with the red Foliage it's super easy to spot them, which is not the case with some of the other peach trees. So, I can come through here and pop off my fruit. It's part of my fruit thinning and getting this down to one fruit per four inches. As always, it's really easy to find your fruit on this Flat Wonderful tree and I'm really looking forward to getting some nice, big Flat Wonderful fruit this year by rigorously thinning and making sure that I get these down to one fruit per four inches of branch. Thanks for joining us here and look for the some of our other videos to help you get big, juicy fruit at the end of your growing season.